Picture the following scenario: You are stretched out in a chair at the dentist’s office as a dental assistant clips a paper bib around your neck. Someone switches on a bright overhead light and you see latex-gloved hands moving toward your open mouth. You close your eyes. Does this make you anxious? If so, you may be a good candidate for sedation dentistry. 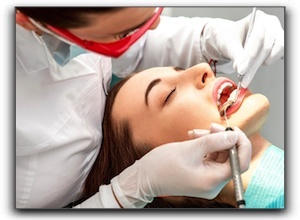 Sedation dentistry like that from The Parkway Dentist in Fort Worth benefits nervous dental patients every day. It can ease anxiety with all types of dental services such as root canals, dental implants, and wisdom teeth removal. If you are planning to undergo extensive restorative or cosmetic dental work, sedation dentistry can keep you calm while the work is underway. We offer nitrous oxide, which has been used in dentistry for more than one hundred years, and IV sedation, our strongest form. Don’t let fear keep you from getting the dental treatment you need. Schedule a visit with The Parkway Dentist in Fort Worth to learn about sedation dentistry. We also provide general and family dentistry. What Can The Parkway Dentist Do For You?